An analysis of the latest massive protest in Moscow shows that the movement is dwindling, but not due to the recent changes in the law on illegal rallies. 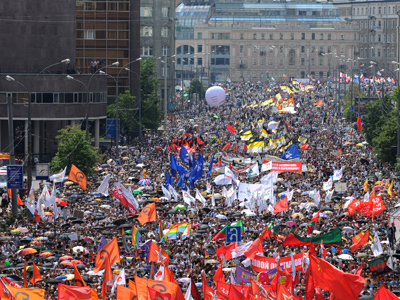 Politicians, journalists and police are still trying to calculate the numbers of the so-called March of Millions protest rally that took place in Moscow on Russia Day. Figures range from about 18,000 – the official police estimation – to the startling 200,000 protesters claimed by the organizers of the march. As for the proof, the Moscow police promised to transfer aerial photos of the march to reporters and let them make their own calculations. One opposition group, the Voters’ League, said it was also ready to present proof of the protesters’ numbers, as they were collecting signatures for a referendum seeking to dissolve and reelect the Moscow City Duma. The group said they handed out about 50,000 forms (all that they had) and received between 20,000 and 25,000 completed papers. Analysts noted that the numbers of protesters had decreased compared to previous marches, especially the May 6 rally, but also that the march was well-organized by the protesters themselves and was conducted without conflicts (the same May 6 march ended in clashes and arrests). 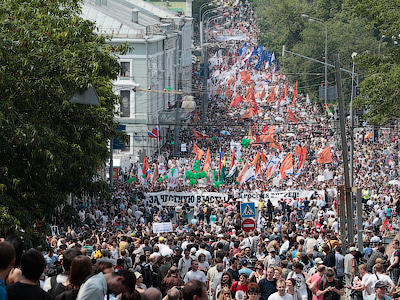 Political scientist Sergey Markov has told the RIA Novosti that the opposition activists who prepared the march were themselves interested in the peaceful course of events. He said that the May 6 conflicts can be explained by the fact that the opposition leaders sought to appear in news reports along with Vladimir Putin’s inauguration and they wanted these reports to be as vivid as possible. However, ordinary participants of the march were upset by the fact that they had been used and they led the next major march in the peaceful way they preferred, Markov added. Political expert Aleksey Mukhin told RIA Novosti that the dwindling interest in protests was caused by the fact that the opposition leaders are not offering any fresh ideas and plans. “The very idea of the mass protest has already depleted. It is worthy to think of a new agenda rather than simply march in the streets,” the agency quoted Mukhin as saying. On the other hand, the president of the National Strategy Institute, Mikhail Remizov, noted that as the protests become more ordinary, the protesters become more radical and professional. “The basis of the street protest has been formed, but within the current agenda it is not growing,” Remizov said. 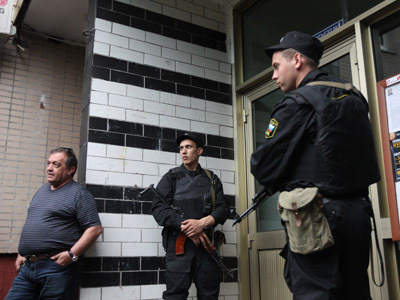 The head of the security department of the Moscow municipal government, Aleksey Maiorov, on the other hand, said that the peaceful character of the march was achieved due to the recently amended law on street protests, which introduces much stronger responsibility for the rally organizers. “The fact that the event went on without incidents is explained by a complex of actions undertaken by both sides. First, organizers and participants of the rally were interested in holding it on a decent level and they succeeded in this. 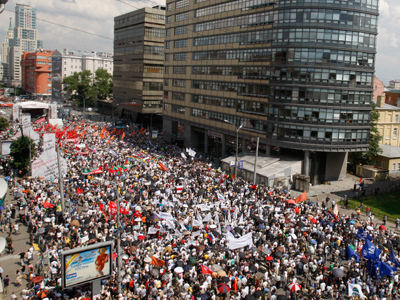 Second, at the final stage of negotiations over the march we attracted the public to control the whole event. As a result, none of the sides can interpret the event to their benefit,” Maiorov said.